Hong Kong, 19 September, 2018 – Social Impact Partners (“SIP”), a pioneering venture philanthropy fund in Hong Kong, closed its second fund raising SIP II with a total of US$2 million (HK$15 million) to further its mission to enable sustainable change to systemic social issues. SIP II is supported by donations from the foundations of financial institutions including, All-Stars Investment and Baring Private Equity Asia, family foundations including, Chen Yet-Sen Family Foundation and Fu Tak Iam Foundation, as well as high net worth individuals. SIP II follows the successful deployment of funds from SIP I to five local social purpose organisations (SPOs) addressing issues in social education, youth well-being and the environment, with each organisation receiving an average HK$2.5 million. In addition to financial support, SIP provides management counsel. Pro bono advisory is provided by our strategic partners, who are experts in their own field, including, Bain & Company, Brunswick, Clifford Chance, Newgate Communications and PwC. Deal teams led by Partners at these firms work with SIP and our portfolio organizations on tailored advisory engagements. Leveraging the SIP network, SPOs gain access to these valuable resources. One dollar into SIP deploys two dollars of investment value into SIP’s portfolio – an exponential return of positive social impact. 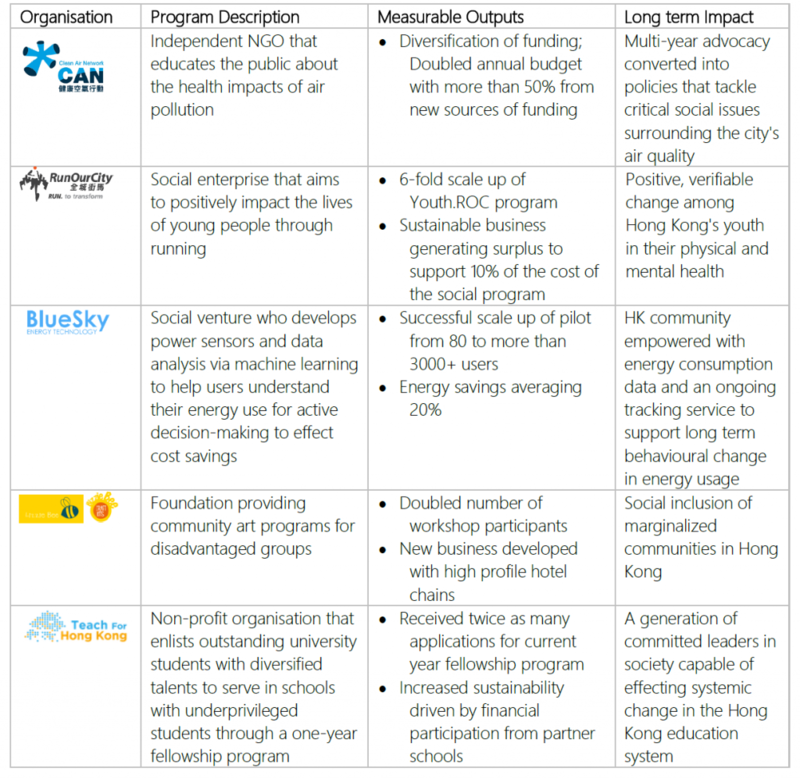 SIP will continue to deploy projects that support social enterprises and other social purpose organisations in scaling their impact and making positive change in Hong Kong. Today SIP also announces the appointment of three new Directors, increasing the number of Board members to seven. They are Vinit Bhatia from Bain & Company, Jonathan Fu from Fu Tak Iam Foundation and Mingxia Fu from All-Stars Investment, following the retirement of Douglas Miller, one of SIP’s founding investors. The new Directors will bring extensive experience in investment and social purpose projects to the Board by providing direction in deploying new funds and supporting the existing portfolio. “SIP is one of the pioneers in Hong Kong that supports social purpose organisations through venture philanthropy. It is a meaningful way to support the needed social change through financing grassroots enterprising organisations. I am delighted to have been a part of it, and now to contribute more as a Director.” Said Vinit Bhatia, who already worked as Pro Bono Partner for SIP since 2014. Vinit Bhatia is a Partner with Bain & Company, a world leading management consulting firm, the co-head of Bain’s APAC Performance Improvement practice, and the co-head of Bain’s Private Equity Practice for Greater China. Vinit has also led much of Bain’s work in Hong Kong in the not-for-profit sector. He has led numerous engagements with social enterprises and NGOs that include organisations focused on social welfare, the arts and environmental causes. Jonathan Fu currently serves as Trustee for the Fu Tak Iam Foundation Limited, a charitable foundation based in Hong Kong. He is also Managing Director at Eurasian Management. Prior to launching Eurasian Management in 2008, Jonathan spent five years at Walter Scott and Partners Limited, Edinburgh, where he was responsible for managing the firm’s Asia ex-Japan and Emerging Markets investments. Mingxia co-founded All-Stars Investment in 2014. He is currently a managing partner of the firm, focusing on investments in technology, consumer and healthcare companies in Greater China. Previously, Mingxia joined Morgan Stanley in 1992 and rose to become the Co-Head and Managing Director of Private Wealth Management Asia Pacific for Morgan Stanley. During his 21-year-tenure at the firm, he was a pioneer of the China wealth management business.